At the Grape choice last week I had a chance to sample a delicious Shiraz/Grenache blend from McLaren Vale, Australia. A good balance of lively berry flavors, spice, acid and oak. At $10 a bottle it’s a terrific deal! 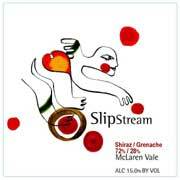 Posted on April 17, 2010, in Australia, Random Reviews, Uncategorized and tagged Australia, Grenache, McLaren Vale, Shiraz, Slipstream, Slipstream Shiraz/Grenache 2006, the Grape Choice. Bookmark the permalink. Leave a comment.